TM-H2000 is a hybrid printer with a MICR(magnetic-ink character reader), a high speed thermal receipt printer, and an endorsement printer. The compact design offers the smallest footprint in the industry. 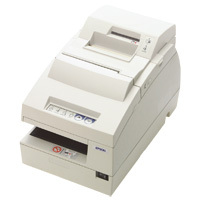 The TM-H5000 high-performance printer offers a thermal printer for crisp, clean receipts and an impact printer for printing slips up to A4 size. 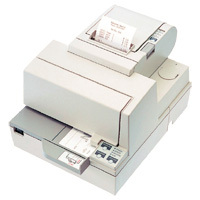 The TM-H5000II high-performance printer offers a thermal printer for crisp, clean receipts and an impact printer for printing slips up to A4 size. This model is sold in Europe, Australia,Koreag, North America and Latin America. 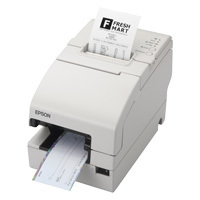 Designed for speed, the Epson TM-H6000 prints receipts at an impressive maximum speed of 170 mm/sec. THe checks can be printed and endorsed without the need to be manually reversed. Designed for speed, the Epson TM-H6000II prints receipts at an impressive maximum speed of 170 mm/sec. 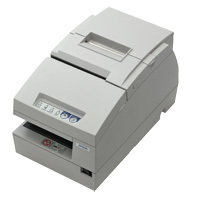 The checks can be printed and endorsed without the need to be manually reversed. This model is sold in Europe, Singapore, Australia,Hong Kong, North America and Latin America. 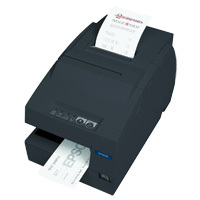 Designed for speed, the Epson TM-H6000II prints receipts at an impressive maximum speed of 170 mm/sec. Checks can be printed and endorsed without the need to be manually reversed. TM-H6000III prints receipt at speeds of up to 200 mm per second - 15 % faster than the TM-H6000II. With two-color, advanced graphic and barcode printing capability, this printer provides highly customized receipts including logos and promotional messages. This model is sold in Europe, Singapore, Australia, Hong Kong, North America and Latin America. TM-H6000III prints receipt at speeds of up to 200 mm per second - 15 % faster than TM-H6000II. 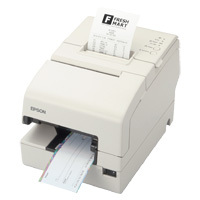 With two-color, advanced graphic and barcode printing capability, this printer provides highly customized receipts including logos and promotional messages. 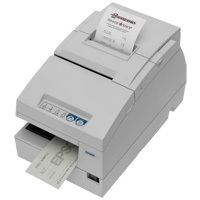 TM-H6000IV is a hybrid printer with a receipt/MICR/endorsement/Validation. TM-H6000IV is leading the POS market with a high precision MICR and ensures the industry's fastest level receipt printing and check processing. 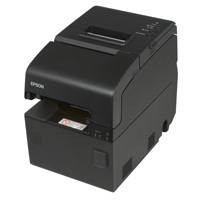 The print sppeds for receipt is up to 300 mm per second - 50 % faster than the TM-H6000III. With two-color, advanced graphic and barcode printing capability, TM-H6000IV provides highly customized receipts including logos and promotional messages. The TM-H6000IV can cut your paper consumption with new paper saving functions such as saving the top margin, blank spaces of receipts, and the barcode height without any change to the application programs. Besides, TM-H6000IV reduced the stand-by power less than half of TM-H6000III's, so it can dramatically cut power consumption. This model is sold only in Europe, USA. TM-H6000IV-DT has the function to seamlessly connect POS peripheral devices and server services. By using TM-H6000IV-DT, the users can construct POS solutions of the next generation that have excellent connectivity and services. • The same footprint as with TM-H6000IV allows installation in the existing counter space. • Many interfaces for POS such as Powered USB are installed, allowing use of POS devices supporting various applications. • Large-capacity storage is installed, enabling the system to support various applications. TM-H6000V is leading the POS market with a high precision MICR and ensures the industry's fastest level receipt printing and check processing. - High throughput using bidirectional minimum distance printing. - Check MICR reading, endorsement printing, and slip printing are performed continuously in that order. - High speed printing (350 mm/s maximum). - Bar code and two-dimensional symbol printing.